John has been my spiritual father and mentor since 1991. My son, Ignatius, and I are so blessed that he welcomed us to his home in England and blessed us. I told John that when I prayed to the Lord Jesus Christ of what He wants me to do when I become a bishop, Jesus' answer was, "Do what is in Acts 6: 4 'We will give our attention to prayer and the ministry of the Word." The Lord told me to help our people to establish an intimate relationship with Him through prayers and to teach them to listen to Jesus' Word. You know, brothers, that our visit to you was not a failure. We had previously suffered and been insulted in Philippi, as you know, but with the help of our God we dared to tell you his gospel in spite of strong opposition. For the appeal we make does not spring from error or impure motives, nor are we trying to trick you. On the contrary, we speak as men approved by God to be entrusted with the gospel. We are not trying to please men but God, who tests our hearts. You know we never used flattery, nor did we put on a mask to cover up greed - God is our witness. We were not looking for praise from men, not from you or anyone else. As apostles of Christ we could have been a burden to you, but we were gentle among you, like a mother caring for her little children. We loved you so much that we were delighted to share with you not only the gospel of God but our lives as well, because you had become so dear to us. Surely you remember, brothers, our toil and hardship; we worked night and day in order not to be a burden to anyone while we preached the gospel of God to you. You are witnesses, and so is God, of how holy, righteous and blameless we were among you who beleved. For you know that we dealt with each of you as a father deals with his own children, encouraging, comforting and urging you to live lives worthy of God, who calls you into his kingdom and glory. And we also thank God continually because, when you received the word of God, which you heard from us, you accepted it not as the word of men, but as it actually is, the word of God, which is at work in you who believe. 1. To have the gentleness of a mother and the passionate of a father to build up relationship with God and His people. 2. To be a steward of God's Word. 1. There are less than 10% of Christians have daily devotion which makes the "Parable of the Growing Seed" unable to work out as from "Stalk, head, full kernel to harvest". Without a daily intimate realtionship with Jesus, the stage stops at the first phase - the stalk or even wither at this stage. 2. Every Christian needs a good Discipler to help for a period of time(Jesus used three years)to ensure a healthy daily devotion habit. As in Paul Stanley and Robert Clinton's "Connecting" clearly stated "In order to know and follow Christ, a disciple needs to extablish habits that will affect his or her character and destiny. Such habits are essential to the disciple's lifelong pursuit of Christ. Habits do not develop easily; human nature resists change...the effort needed to break or establish habits to the great amount of energy initially needed by a rocket to overcome the earth's gravitational pull. Once out of the earth's atmosphere, however, the rocket glides with small amounts of energy." I have confirmation of these two main findings from many Christian leaders including my two Fuller professors, Rev. Dr. Richard Peace and Rev. 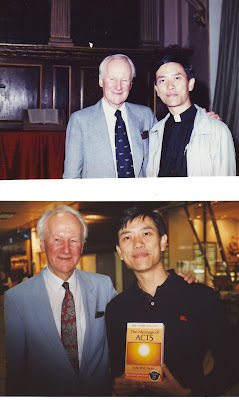 Dr. John Drane(John is John Stott's succesor as the Chaplain of the Royal Family, England). John then gave me his new book he wrote in 2006 "Through the Bible Through the Year". I was shocked to receive his gift for what the Lord asks me to do a 1,189 days of Daily Devotion through my block is the similar idea that John had in this new book. He goes through the whole Bible in a year as in a Daily devotion format for his reader. I told John about my vision and he smiled again and told me that that is a very good and accurate vision from the Lord. "I can't think of anyone who has been more effective(than John Stott) in introducing so many people to a biblical world view. He represents a touchstone of authentic biblical scholardhip..."
John was recently named by TIME magazine as one of the world's most influential people. He gave Ignatius his newest book "John Stott - The Last Word" wrote in 2008. For a young man of 20 to be blessed by John Stott and have John's newest book with a personal message written and signed by John this morning is a big gift from the Lord to my son! What John received from the Lord to me is almost 80% of what I got from the Lord many weeks ago as in Acts 6: 4 but more detailed. How wonderful and miraculous that this could happen and how blessed I am to receive such kind of confirmation and blessings from the Lord through John Stott. He then blessed me and my son and also the oil that I am going to bless during my Installation on Sept. 13, 2009 4:00p.m. at Richmond Emmanuel Church with the presense of Archbishop Yong Ping Chung and Bishop TJ. The oil will then be given to all ACiC/AI churches to be used for baptism, healing and annointing. Thank you for giving me direction and blessings through your servant John Stott. Please strengthen and anoint me that I can be a good apostle of you to follow the footsteps of all my mentors whom you have prepared for me to extend Your Kingdom and that you Name will be glorified. In Jesus Holy and precious Name I pray. Amen. If we follow Jesus pattern of how He discipled His apostles then we know how Micro he worked as he used three years to live with his apostles that "Conversion" and "Transformation" happened. We can see how the harvest came according to Acts in a Macro way. Can you imagine how many is "a hundredfold"? If you add up 1 + 1= 2, 2+2=4, 4+4=8....then "a hundredfold" is 30 zeros after 1. I am doing some research on what is the percentage of Christians having daily devotion and up to now the statistic is below 10%. I come into an awareness why churches nowaday can not experinece the Macro growth eventhough we have quite a number of mega churches. It is the Micro we have forgot that after the "blade" it withered and there is no "ear", no "grain" and no "Harvest". There are 1,189 chapters in the whole Bible and I devote myself to share my Spiritual Journal of reading the whole Bible of one chapter a day starting 20 days before my Consecration, 9 September, 2009, for 1189 days. I do this hoping that I can encourage each one of you who read this block to have daily devotion so that an intimate relationship between you and Jesus can be established and that through this Micro "workout" Macro growth will come to extend His Kingdom. Ignatius Ng, Richmond Emmanuel Church, any day from Sunday to Saturday, any hour from 12a.m. to 6a.m. 2. Participate in reading one chapter a day with me for 1,189 days to have a fresh beginning to read through the whole Bible and to receive fresh annointing from the Holy Spirit by doing so in one accord. I am going to publish my block of the Daily Devotion on August 20, 2009 and the 24 hours name list will be published on August 15, 2009.